I recently installed several Ubiquiti UniFi devices on my network. I have a UniFi Security Gateway (USG), two UniFi AP AC PRO wireless access points, and a UniFi Cloud Key. How can I monitor these devices with PRTG, has anyone developed a sensor or script yet? We've put together an EXE/Script Advanced sensor that you can use to monitor general statistics and information of your Ubiquiti UniFi deployment, regarding especially the access points. The PRTG probe on which you want to deploy the sensor must be able to reach the UniFi controller on the "API" port (default is 8443). The PRTG probe on which you want to deploy the sensor must run PowerShell version 3 or later. The script was tested with the UniFi controller versions 5.3.8 ~ 5.8.24. Note: We cannot guarantee that it works with other UniFi controller versions. Configure your PRTG probe to enable the execution of unsigned scripts/code. For further information refer to the Knowledge Base articles Guide for PowerShell based custom sensors and PowerShell 32-bit and 64 bit and execution policy. The sensor will not produce any alerts by default, unless it is unable to authenticate or contact the UniFi controller. Once the sensor is deployed, you're advised to set up limits in the channel's settings. For example, define a lower error limit for the number of connected access points. This way you are notified as soon as the number of connected access points is lower than expected. Please refer to this set up guide for notifications using limits: Notification via Limits - Example. 2. Create a new device in PRTG with the address (IP or FQDN) of the UniFi Controller that you want to monitor. 3. Now, select Add Sensor. On the search field, type "Script Advanced" and then select the EXE/Script Advanced sensor from the result list. 4.2 Under Exe/Script, use the Drop-down to select Custom Powershell Unifi Status.ps1 from the list. You can omit -port and -site when working with the default. For non-default sites, use the site's "code" as pointed out here by wimkoopman. 4.3 Unless required for other reasons, leave the default Environment and Security Context and Mutex Name. 4.4 Reduce the Timeout to 30 seconds, the query shouldn't take this long. 4.5 The EXE Result should only be enabled if you need to troubleshoot the sensor's execution. 4.6 Click Continue to deploy the sensor. 5. The sensor should display channels and values after one scanning interval. Once this happened, you can start adjusting the channel limits to your requirements (optional). # must also match the log-in/password from the controller. This way you don't leave the password exposed in the sensor's settings. # It's recommended to use larger scanning intervals for exe/xml scripts. Please also mind the 50 exe/script sensor's recommendation per probe. # The sensor will not generate alerts by default, after creating your sensor, define limits accordingly. # This sensor is to be considered experimental. The Ubnt's API documentation isn't completely disclosed. Write-Output "<text>Powershell Version is $($PSVersionTable.PSVersion.Major) Requires at least 3. </text>"
# Create $controller and $credential using multiple variables/parameters. #Query API providing token from first query. Write-Output "<text>API Query Failed: $($_.Exception.Message)</text>"
# Iterate jsonresultat and count the number of AP's. #   $_.type -like "uap" = Access Point ? # Write JSON file to disk when -debug is set. For troubleshooting only. [string]$logPath = ((Get-ItemProperty -Path "hklm:SOFTWARE\Wow6432Node\Paessler\PRTG Network Monitor\Server\Core" -Name "Datapath").DataPath) + "Logs (Sensors)\"
Check your Powershell version. Just type $PSVersionTable in a PowerShell prompt. Make sure that the execution of scripts is allowed on the PRTG Probe where you've deployed the sensor. Double check that the parameters are correct and that the credentials are valid. Make sure that the remote probe can reach the UniFi controller at the required port. A proxy may not work here. You can append the -debug parameter, the script will then write the whole JSON-formatted content to a file named unifi_sensor...json under Logs (Sensors) in PRTG's Data Path. This should be disabled when debugging is complete as it will endlessly create new files. For any other troubles: Don't hesitate to contact us by replying to this post or by contacting us via a support ticket. Please also link this Knowledge Base post. 0.5 2017/02 -Includes a channel for "Access Points Upgradeable"
Please understand that we cannot provide in-depth technical support for custom sensors nor can we guarantee that the above described sensors will work on your systems. You use all components at your own risk. Feel free to further modify this script to monitor other properties, feel free to share it (free of charge) as well. 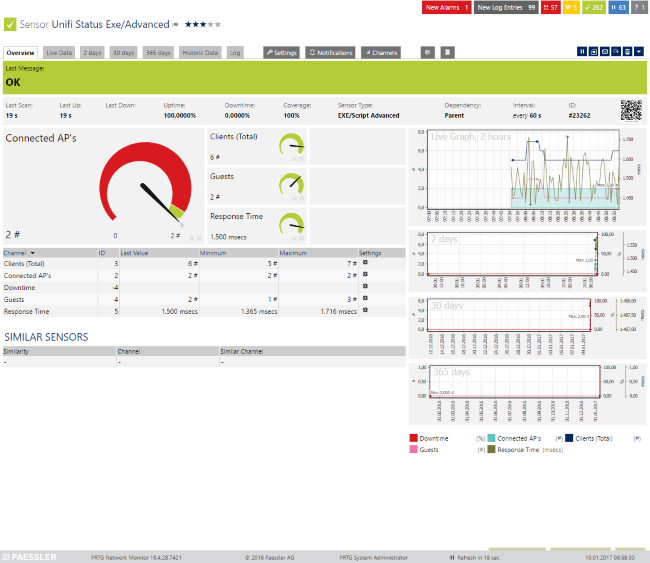 We haven't experimented with Ubiquity's devices until now, from support experience we know that some device families (Airmax, Airfiber) implement SNMP (V1, rather limited) through proprietary or trough Mikrotik's MIB, but at this time there's no definitive answer we can provide on the subject for the UniFi family of devices. The UniFi Controller offers an HTTP API that can be used to query statistics, for PRTG integration this would mean a custom exe/script sensors or multiple HTTP XML/REST Value Sensor(if compatible). KB: Can't find a sensor for my device in PRTG but I believe it supports SNMP. How to proceed? 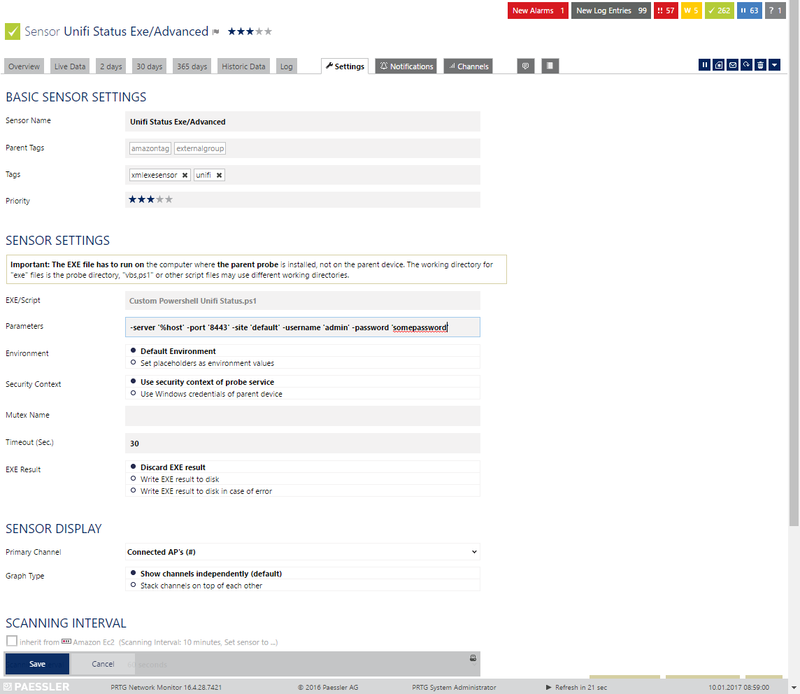 KB: What can I monitor with the SNMP Custom Table Sensor? I'll leave your inquiry open should someone else with more experience on these devices be able to contribute as well. Can you easily add information like 2G clients 5G Clients RX TX CH. Util 2G CH. Util 5G Would be highly appreciated !!! thank you very much for your feedback and input. Regarding your inquiry, yes, that should be possible with minor modifications. As a general rule, everything that's available in the web-interface (properties, counters) is also available in the API. I advise you to copy/paste this code into Powershell's ISE, you can then run the code once to get all variables assigned with values. Then, just run (using Run Selection) the following command/variable: $jsonresultat. This will print-out the whole content of the variable, which is a huge chunk of JSON-encoded data. There are tens if not hundreds of properties available, feel free to modify the script (or add/remove logic and channels) to fit exactly your requirements. There are also links in the script to the available documentation provided by unifi, it provides hints to what's available/possible. Anyone have any guess what this could be? Hello there Bosse, please beware that I haven't tested the script with version 5.2.9, so I can't guarantee that it ever worked. However, I don't see why it shouldn't.. Please try something else: Instead of deploying the sensor in PRTG, open up the 32-bit powershell shell (Windows Powershell x86), navigate to the path of the script and run it from there, using the same parameters. PS & '.\Custom Powershell Unifi Status.ps1' -server "unifi.domain.tld" -port "8443" -site "default" -username "user" -password "somepassword"
What's the outcome? This may provide us further details about what's going wrong. Thanks for your very helpfull tips. I did as you wrote. I tested the script directly in PS and noticed some issues (only my fault). After some trial and error it worked perfectly. The sensor is now up and running! Looks great ! However, I'm stuck with PS v2 on some of my servers (SBS2008). Has anyone rewritten this PS script for PS 2 ? I'm not sure if any other cmdlets will also required adjustments. Keep in mind however that you could employ a remote probe in PRTG, this would allow you to run the script somewhere else (on a different system). Or even, do an Invoke-Command and run the script on a different system that has a newer powershell version. I'll leave your reply published in case anyone else has input, but I'm not working on any PS2.0 compatible version at the moment. updated my Unifi Controller to 5.6.x unfortunately the PS script has stopped working. any ideas? Please clarify what "stopped working" means in this case. I encourage you to run the script from the command-line to check whenever it works. But keep in mind that you need to include the correct parameters. You can also include -debug in the parameters to write a log file. Please refer to the "Troubleshooting" section in the main article. Hello @crazypete00. Please note that the latest stable unifi release at the time of this writing is 5.4.16 - I can confirm that the sensor works with that version but haven't tried the beta version yet. If you get me credentials and a controller to connect to I can take a look into why it doesn't work. I am trying to add Unify AP into PRTG, I am getting an error from PRTG that user is not authorizerd. Can you please tell me if this can be related to SW that we are running on WLC - 3.2.10 Power shell is 4, and account that I am using has role as admin. thank you for your post/reply. I've never tested the script against a 3.2.10 controller. The API's could greatly differ and I'm unable to confirm that it would work. You may want to consider upgrading/deploying version 5.x instead. Other than that "user is not authorizerd" sounds like an authentication issue. Make sure you're providing valid credentials to the script. Otherwise, please let me know the complete result/error. If you have a proxy in place it could also be denying the HTTP connection to the controller. But could not find a Debug File. Shuld the Debug File not be on the Core Server \PRTG_DB\Logs (Sensors)? An unexpected error occurred on a receive. Are you using any different protocol or version? You could change this setting (directly in the script) for additional testing. Is the Unifi controller that is being polled up-to-date? Was the Powershell version on the probe perhaps updated/downgraded? The exception is thrown by the Invoke-Restmethod, so you could also search for generic documentation about this error: powershell "An unexpected error occurred on a receive"
Lastly, regarding the -debug option. It will only work if the sensor is actually able to perform the API call. Since the authentication is failing, the sensor doesn't even connect (and the debug isn't written). Excellent - worked like a charm! Many thanks for this! I also tried the german extended script, but could not get that to work either. The output from the command-line confirms that the sensor is working and so is the authentication/credentials. Now we need to find out what causes the XML code produced by PRTG to not work (what leads to PE231). Within the Sensor's settings it is possible to set the "EXE Result" to "Write EXE result to disk". Once configured to do so a resulting Text File (Filename: 'Result of Sensor [ID].txt') will be stored under the Logs (Sensors) directory on the next scan of the sensor. This folder's path is by default "C:\ProgramData\Paessler\PRTG Network Monitor" of the probe where the sensor is monitored. If you're not able to spot anything wrong with the logs of the sensor, please share these so that we can have a look. Thank you Luciano. It ended up being the 32 bit Powershell restrictions. Once I did that it worked fine. Alternatively, you could configure/enable the "Write EXE result to disk" to find out what the actual output is (that leads to the PE231 error). I recently updated Unifi to a new version (5.6.29) which is beyond the the firmware listed above. I now get the error "Authentication Failed: The request was aborted: Could not create SSL/TLS secure channel." when ran from PS. Would any one have any suggestions on what might cause that error? I would really like to get this sorted as I find it is a very useful sensor. I have not validated the sensor against the version above because I didn't get a chance to update yet, but will update the document/page as soon as I've updated to test. So it appears as if for some reason powershell doesn't like the certificate os ciphers supported by your instance. The script is supposed to work with TLS1.2, TLS1.2, TLS and SSL3.0. The sensor is also supposed to ignore certificate errors. Unfortunately that's all I can tell you for now, but will update the document as soon as I've updated my test controller. Thanks for the reply Luciano. Your reply lead me to resolve my problem. I had not updated my script to the latest version. It now connects fine. thank you for your reply and happy to hear it worked out. All settled then. Have a nice weekend! Thanks for creating and sharing it. Any chance it could also include some data like Top AP (user/bandwidth), or throughput in last 24 hours. Details like you see on the main Ubiquiti statistic page? You're more than welcome, I'm happy it was useful to you. The problem with this sort of "top" metric is that PRTG doesn't really have a way to display it in PRTG, channels are too static for this sort of information and I'm not able to display custom data in a toplist at the present time. Under remarks, there is a link to msxfaq.de: PRTG mit Ubiquiti WLAN Access Points, this is a "fork" of my script that includes per-access point data, in case that helps you in any way (but it requires one sensor per access point, so it may only be useful/applicable up to a deployment size). Is there a way to get more information via PS from the USG? Haven't had a chance to try that yet, but if the information is available on the Unifi Controller over the API, then most likely it could be polled using a similar script as the one above. What sort of metrics/values/readings from the USG are you looking for? I have upgraded the controller from 5.4 to 5.7 and now I too am getting "Authentication Failed: The request was aborted: Could not create SSL/TLS secure channel"
I get this if I run the Powershell script from the PRTG server, or directly on the Windows server running the Unifi controller software. Please double check that you are indeed using the latest available version of the powershell code, the original version of the sensor/script didn't correctly handle some cyphers, as I've mentioned here. The Custom sensor runs in powershell and interacts with the Web-Interface/API of the controller directly, no JAVA is required for the sensor to work. This works great. But is there similar sensors for the switches and gateways from Unifi? There are currently no plans for this. But should be possible with minor modifications to the script. "API Query Failed: The remote server returned an error: (401) Unauthorized." Authentication itself is working good. Any hints on this issue? Please try and run the script from the cmd, do you get the same output? The The remote server returned an error: (401) Unauthorized. error actually comes from the controller itself. Perhaps the account isn't allowed to use the API? Or the password and site don't match? (If you don't specify a site, it will use the default. If you specify a different one, it will use the different one. Double-check that the user has access to the queried site. If the above doesn't explain the issue, perhaps your account name or password contains ' and this is escaping the password and messing the script? You could try with a alphanumerical account and password (no special characters). Version 5.6.37 should definitively work. Controller Version is 5.8.24 and script is version (0.8) published on 27/06/2017. I got Unauthorized Access. I have no problem to access the controller by using chrome so username and password should be correct and password no ' and special char. If you're still unable to explain the behavior, please contact us and reference case number PAE1068262. But you will need to provide us temporary credentials to test the script/sensor with your instance for us to be able to investigate this further. I am having the same error as @yvan_rossier, whenever there is NOT also a sensor of type "HTTP Push Data Advanced" running on the same device, using port 5050. I can't seem to figure out why that is needed. I tried this version and the German "fork" of it. Is this the first custom PowerShell script for this PRTG installation? If so, please review our guide for PowerShell based custom Sensors, especially step 1. As I was one of the impatient people about to post asking for help with the XML/JSON error below, I thought I'd better contribute back with a positive response instead. I had also tested in Powershell and it was generating the expected results. I'm as bad as the next person for skipping through the guide too quickly then wondering why it didn't work; if you read carefully it does say the above in the guide!